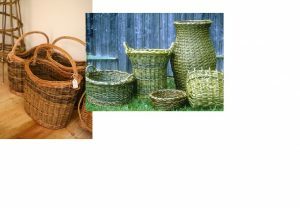 Two-day workshop in basketry for beginners, refreshers and improvers! A weekend workshop for people of all abilities which would like to learn this ancient craft or improve existing skills. It is also for people who have taken a basketry course before but would like to go over the basics again. Jane Wilkinson will tailor the course so that you work at your own pace and to the level which suits you. There will be staggered start times for groups of different abilities. Those who are new to basketry will make round baskets, while those who have some previous experience will have the chance to focus on oval baskets and handles. Think of summer shopping expeditions or a container for gathering and storing all these lovely summer vegetables. The choice is yours. Jane is a highly experienced willow weaver and teacher. You can see examples of her beautiful work at www.specialbranchbaskets.com. Expect a weekend of hard, rewarding work plus good fun in excellent company. Cost £80 plus charge for materials.